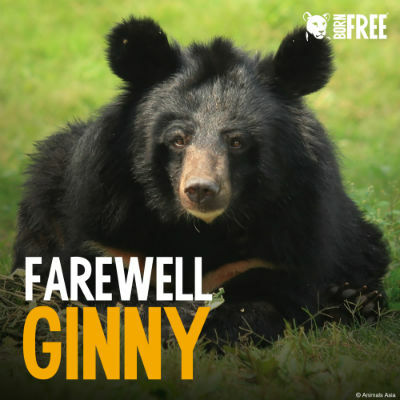 We are extremely sad to report that our adopted moon bear Ginny recently passed away following a short illness. Ginny, who was named after our Co-Founder & Trustee, Virginia McKenna OBE, was rescued from a bile farm by our friends at Animals Asia in 2000. Nursed back to health, she enjoyed a long and happy life at their bear sanctuary near Chengdu in China. Our supporters had adopted her for many years through our animal adoption programme. An estimated 10,000 bears are kept in farms in China where they are cruelly milked for their bile for use in traditional medicine. Bile is a digestive fluid produced by the liver and stored in the gall bladder, then secreted to help digest fats. To extract the bile, a metal catheter is painfully inserted into a bear’s gall bladder. We are supporting Animals Asia in their work to end this barbaric trade.